Although Korea is about one third Christian, it does not have a long Christian history, and as such, Christmas here is a little different than in the West. 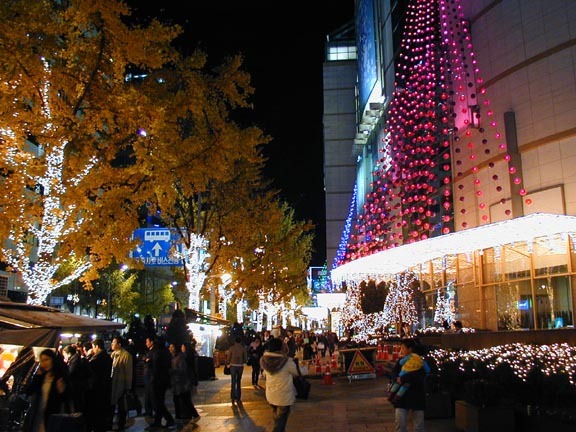 As in the West, Christmas tends to be more commercial than religious and so starting in early-November many of the large shops and department stores in Seoul put up their holiday lights (see photo: Myeong-dong shopping street). Christmas trees start to appear near the middle of November in plazas, hotel lobbies and department stores (see photo: Lotte Department Store) and many homes have small artificial trees but they are not usually set-up until a week or so before Christmas. With all the lights, Seoul at night is a really beautiful city, and there is a real feeling of holiday cheer (see photo: in front of city hall). There are even street vendors selling chestnuts roasted on an open fire. Actually they sell those all winter long, and they taste great on a cold wintry day. The big holidays in Korea are Chuseok, which is the Korean Thanksgiving and is based on the lunar calendar so its date changes every year in relation to the solar calendar (the calendar used in the West). This year it was on September 12. The other big holiday is New Year’s Day. Koreans do celebrate the solar calendar based New Year’s Day (January 1), but the big holiday is the Lunar New Year which is the first day of the new moon and is based on the lunar calendar, so it also changes on the solar calendar each year too just like Chuseok. In 2012 it falls on February 3. For Chuseok and the Lunar New Year Korean families brave gridlock traffic to travel to their hometowns and gather with their families for three days. 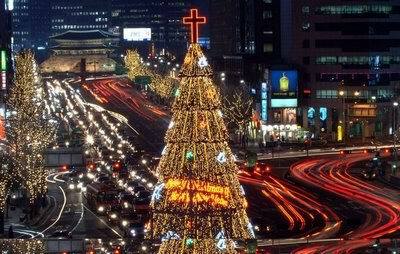 Compared to those holidays, Christmas is not such a big event to most Korean families. Families as a group usually don’t do anything special, but younger people, do take advantage of the romantic feeling of the season and all the beautiful lights, and frequently meet with friends or lovers to enjoy a night out on the town on Christmas and exchange small gifts. Just in time for Christmas we have a number of new items available including colorful contemporary teapot sets that are accented in beautiful pastels and come with four teacups and the pot has a screen inside the stem so green teas (or other loose-leaf teas) can be steeped right inside the pot. We also have red and green lotus jars and red and green and green celadon genie bottles, several new styles of bun-cheong cosmetic cases, and a variety of celadon vases with both narrow and wide necks that are perfect for flowers or simply to display on their own. and many more items are all available on our new items page. See all our new items. Many of our No-ri-gae are on sale and make great, inexpensive, gifts for Christmas. Teas, dolls, and several styles of business card cases are also on sale. We also have bowls, plates and assorted other items on sale. Sale items make great and economical Christmas gifts. See all our sale items here. time). Although Standard/Express shipping times are generally 7-12 and 3-5 days, respectively, to North America, and a few days more to Europe, there may be some delays due to the Christmas rush. Please plan ahead and order early. We cannot promise orders received after these dates will arrive by Christmas. More details. Email exchanges are becoming increasingly unreliable due to the various efforts to thwart unsolicited mail. If you would like to ensure delivery of our messages to you, we recommend you add our domain – Korean-Arts.com - to your list of acceptable correspondents. Copyright © 2002-2011 Korean-Arts.com All rights reserved.